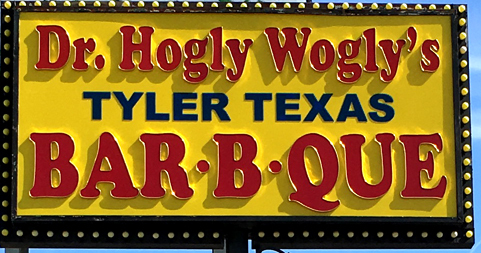 (1969) Dr. Hogly Wogly’s Tyler Texas BBQ, Van Nuys | Remains of L.A.
-A few rows of brown and beige booths, with a small room off to the side with another row of booths. 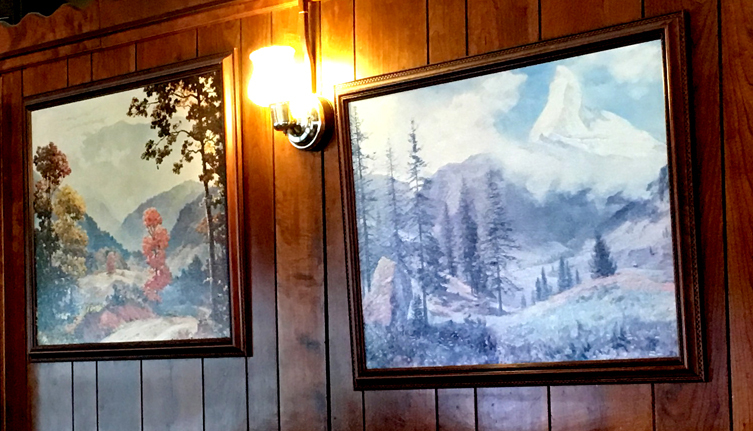 Grey carpet and wood walls, some paintings of forest scenes and cowboys on the walls but mostly the walls were covered with awards and certificates and magazine articles stating that they have extremely good food–the words “best” and “favorite” were heavily featured. At the front of the restaurant is a big crystal chandelier. It doesn’t seem to fit with the rest of the decor and I tried to imagine how it got there. A wedding present, maybe. 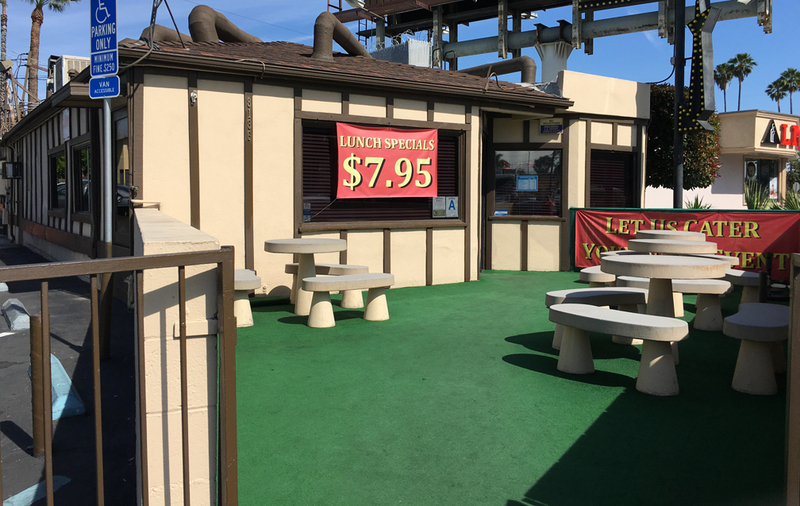 There is a nice patio outside, with concrete furniture that had an odd sort of Flintstones vibe. -I got the barbecue chicken. I was going to get the a la carte half chicken and some a la carte sides, but the waitress pointed out that it cost almost the same to get the whole chicken entree, which came with sides. So I did, figuring I could take home the leftovers to David (my husband). I’d never realized how much chicken is in a whole chicken, or how intimidating it could be to have a whole chicken, in many pieces, put down in front of you on a plate. I got baked beans, fries, and bread, but didn’t eat that much of them because I was trying to make a dent in the chicken. David (my husband) got a ton of food that night. -There wasn’t a kids’ menu; they seemed to think such a thing would be condescending. “Kids know what they want,” we were told. -The waitress was really funny. She’d say things and then add “but what do I know,” like a comedian’s catch phrase. She made me laugh a lot, and at one point when Rocco was getting a little loud she came over and started singing with him. When Corey ordered water she said, “vodka with a twist of lime! Got it.” It maybe doesn’t read that funny, but she made it work. -There was an old guy who looked a little like Santa sitting in a booth near ours. He was alone, and not reading or anything, just eating a barbecue sandwich. The sandwich was clearly making him very happy. I was extremely impressed by the way there was no barbecue sauce on his beard or mustache. Can’t imagine how he managed that. -The waitress brought two kinds of barbecue sauce to the table: a small pitcher of regular sauce and a squeeze bottle of spicy sauce. I nervously tried the spicy sauce, found that it was indeed way too spicy for me, and went back to the regular, which I liked a great deal. -There were a couple slices of pickles–bread and butter pickles, I think–on top of the chicken. I’d never seen that before. I don’t like pickles outside of sandwiches, so I tried giving one to the toddler Rocco, who didn’t like it either. I gave him some french fries instead, and some chicken. He liked those. -There’s a display case by the front door, with t-shirts and hats, and also a line of empty bottles of varying sizes. I couldn’t figure out why there were empty bottles on display, but eventually the light dawned: these were to show what size bottles you could get if you wanted to take home barbecue sauce, and since it was fresh, they couldn’t fill the bottles with it and then put it on display. Not sure why that took me so long. It just looked odd. -I didn’t notice till after we’d eaten that there was a sign that said “Please sign guest list; to better serve our customers your entire party must be present before we can seat you.” Our entire party hadn’t been present when we sat down, but that must only be when they’re very busy because they didn’t say anything. I meant to go over and sign the guest list and then I forgot until I wrote this blog post. 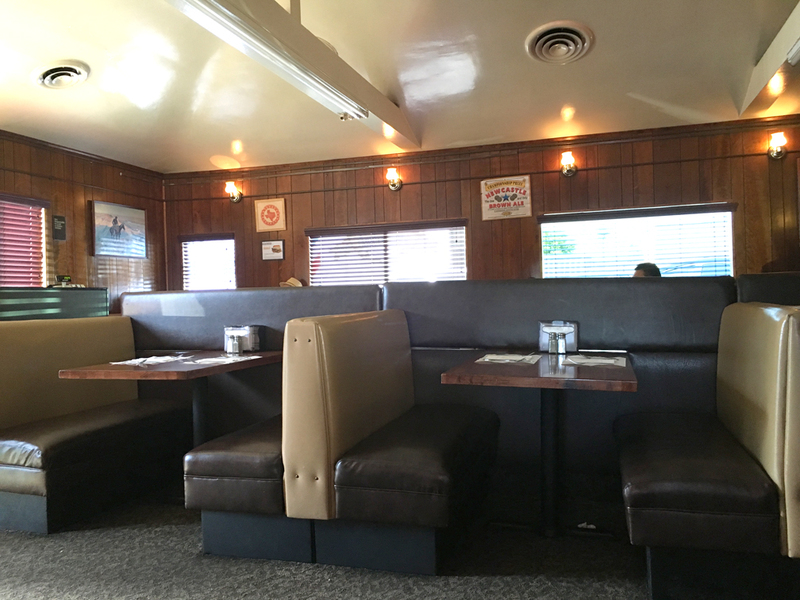 -There’s a framed picture on the wall, showing that Dr. Hogly Wogly’s was named “viewer’s favorite” by the KTLA morning news. From a distance it looked like it was literally a screen shot of the episode, and I was a bit disappointed when I got closer and saw it was not. What I Ate: Bread, baked beans, french fries, a whole lot of chicken. Who I Ate With/Things We Talked About: Michael, Rocco, and Corey; Carmela Ice Cream in Woodland Hills, “Skullduggery,” which is opening at Sacred Fools soon, the zoo, and the California Institute of Abnormalarts. What Sort of Ghost I’d Expect to Find if I Believed in Ghosts Which I do Not: A bunch of little kids whose moms brought them to Dr. Hogly Wogly’s at least once a week in the summer. They’d eat outside on the patio so it didn’t matter how messy they got. Note: Unless otherwise stated, all ghosts mentioned in this blog died peacefully of old age and then reverted to the age/place of their choosing.